Too much talk about the alcohol issue is rhetorical. The Social Norms Approach offers a refreshingly honest and helpful approach to the drinking crisis on our campuses by using the peer group as part of the solution. At last, a compendium of social norms information that addresses both the theory and practice of employing this model in higher and secondary education. This social norms handbook for educators, counselors, and clinicians succinctly prepares these professionals to 'act on' high-risk student behavior rather than 'react to' it. Social norms pioneer Wes Perkins has assembled the country's leading theorists and practitioners to create the most comprehensive guide available in this cutting edge field. High-risk drinking and its consequences continue to plaque those of us in higher education administration. If five years from now we are still chasing our tails ineffectually because we haven't put the empirically based strategies outlined in this book into practice on our campuses - then shame on us. This book is a compendium of applications and cutting-edge findings for a promising new approach to campus alcohol abuse prevention. 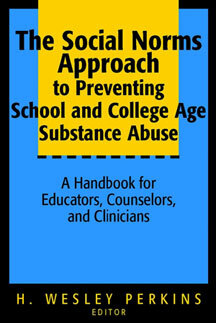 It is essential reading for student personnel administrators in college mental health, fraternity and sorority affairs, and alcohol and other drug abuse counseling. In my community, multiple efforts to reduce underage drinking accomplished little more than dividing it between those who believe in an abstinence only approach, and those who believe in a risk reduction approach. When I began to introduce the social norm theory, I found a new sense of hope that there may finally be something that we could do, as a community, to make progress on this important issue. From the students themselves, to the parents and teachers, our community is uniting behind the positive, non-moralistic and non-coercive approach found in this book. H. WESLEY PERKINS, Ph.D. is one of the originators and foremost leaders of the social norms approach to substance abuse prevention and health promotion. A graduate of Purdue University, he received his MA. M. Div., M. Phil. and Ph.D. from Yale University. Currently he is Professor Sociology at Hobart and William Smith Colleges in Geneva, New York. Dr. Perkins is the author of dozens of journal articles and has been honored with several national awards for his work in preventing alcohol and drug abuse in colleges and universities.